Working with nature allows us to experience its natural cycle every year. Vines awaken from their rest in spring, growing and producing fruit until the next winter when they go to sleep again. This cycle is also evident through the biodynamic practices that we follow on Waterkloof. Circle of Life is inspired by this cycle that exists not only on Waterkloof, but life in general. At Waterkloof we strive to produce the finest grapes by adhering to traditional organic and biodynamic methods. Our methods are based on Old World, sustainable practices in our vineyards to ensure that the vines are nourished, healthy and in balance. Our soils are free of chemicals and are kept healthy by using plant extracts, fungi and bacteria from our own organic compost. We do not spray any chemicals in our vineyards. Our focus is to find natural alternatives and to produce our own compost to ensure soil that is full of life, rich in oxygen and brimming with different insects. We want to be able to smell the soil. Our focus over the last ten years has been to get a better understanding of Waterkloof, and the individual characters of its vineyards. We discovered that vineyards from different parts of Waterkloof produced wines that were stylistically very different. Through the Circumstance wines, we have always tried to allow these vineyards to express their individuality. 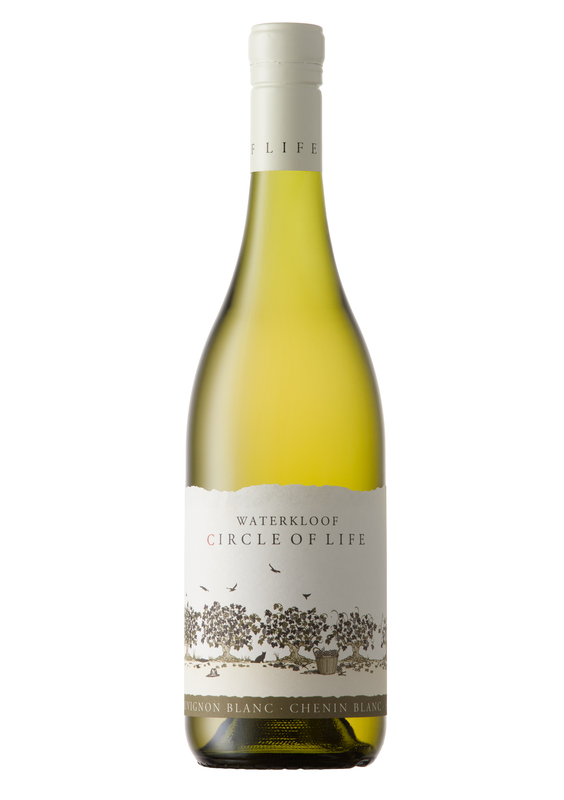 Conversely, our objective with Circle of Life has been to produce two blends which encapsulate all the varying terroir characteristics and grape varietals within Waterkloof. Thus, rather than being constrained by a traditional blending style, for example a Bordeaux or Rhone blend, we have instead produced two wines that are not driven by varietal or a specific parcel of the vineyard, but are wines that reflects the totality, philosophy and specificity of Waterkloof. Ideal weather conditions during the harvest season – moderate day temperatures, cool night temperatures and no prolonged rain and heat waves – had a positive impact on wine grape quality and instilled good colour in the reds and lovely acidity in the whites with balanced flavours. The grapes were healthy with a bit of rot occurring later in the season. We mainly rely on tasting the grapes to determine the optimum stage of flavour development. Grapes are picked early in the morning when they are still cool, which helps to preserve the flavours. Extracting juice from the grapes is achieved through pressing the whole bunches. This is the most delicate way to extract the juice. After a settling period of 24 hours, a large proportion of the juice was destined for co-fermentation. That is to say, we determined a blend of Sauvignon Blanc and Chenin Blanc prior to fermentation and transferred the majority into old 600 litre barrels, with the balance going into stainless steel tanks. Ultimately, this allowed for a better integrated and more complete end product. After a very long, natural yeast fermentation of seven months, the wine was left on the primary lees for a further four months. This helped to add more complexity and weight to the palate. The wine was then racked to fermentation tank and the final blend was made up, with the addition of further Sauvignon Blanc and Chenin Blanc, as well as adding co-fermented Chardonnay and Semillon to the blend. “The wine was then bottled in January 2014. We make the wine as naturally as possible, with no additions of acids or enzymes allowed. The final blend is made up from 60% Sauvignon Blanc, 33% Chenin Blanc, 4% Chardonnay, 3% Semillon. Lime, grapefruit and peach notes, complimented by tropical aromas. Intense flavours, with great balance. A tight mineral core and creamy middle palate allows for great complexity and a persistent finish.